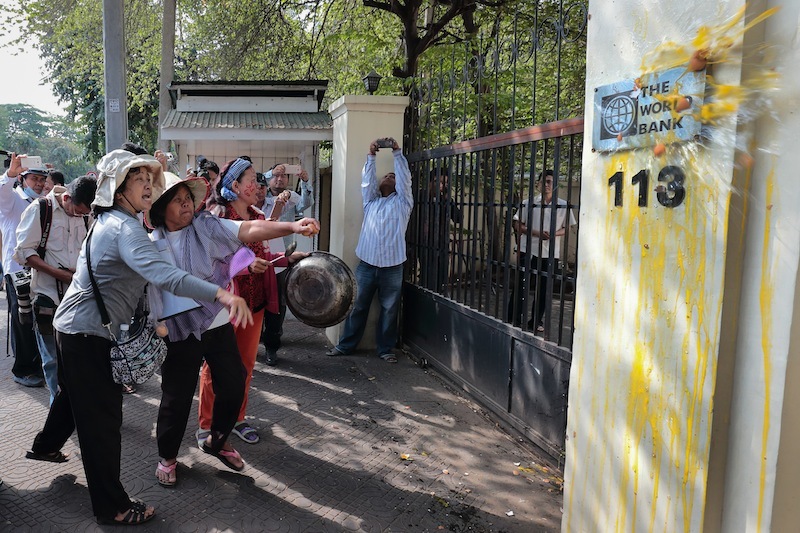 Residents and evictees from Phnom Penh’s Boeng Kak and Bo­r­ei Keila neighborhoods re­turned to the World Bank’s country headquarters on Norodom Boul­evard on Monday to hurl eggs at the front gate and demand that the international lender leave Cambodia. The same group egged the of­fice ex­actly two weeks ago and vowed to return every week until the Bank pulled out, but skipped the following Mon­day because of Chinese New Year. The protesters blame the Bank for letting the government force thousands of families out of their Boeng Kak homes during a Bank-funded land titling project, and for failing to help them afterward. “The World Bank must leave Cam­bodia,” said Sie Nareth, a Boeng Kak evictee and one of about 40 protesters outside the Bank’s offices on Monday morning who pelted the front gate with doz­ens of raw eggs. “We don’t need the World Bank, be­cause the Bank’s loans have caused many people in Boeng Kak to lose their homes for a development project,” she said. Despite last week’s hiatus, Ms. Nareth said the protesters would main­tain a regular egging schedule from now on. “We will come back here every Mon­day to throw chicken eggs un­til they leave Cambodia,” she said. The protesters handed Bank spokesman Bou Saroeun a letter stating their position when they came two weeks ago, but say they have received no reply. Contacted on Monday for comment, Mr. Saroeun hung up on a re­porter. Daun Penh district governor Kuoch Chamroeun called the egg­ing “immoral” and said authorities would take unspecified measures against the protesters if and when the Bank asked for help. City Hall spokesman Long Di­manche called the protesters “gang­sters,” but also said au­thor­ities would not take action un­less the Bank asked them to. “I think this is illegal because they threw chicken eggs at someone’s gate,” he added.